This beautiful Shaker Hope Chest with Cedar Bottom is handcrafted using solid cherry wood. This beautiful Heirloom Chest is Amish handcrafted and is the perfect place to store your heirloom quilts and keepsakes! This Amish furniture is made in America. Consider a Hope chest for a anniversary gift, wedding gift, graduation gift or even birthday gift! 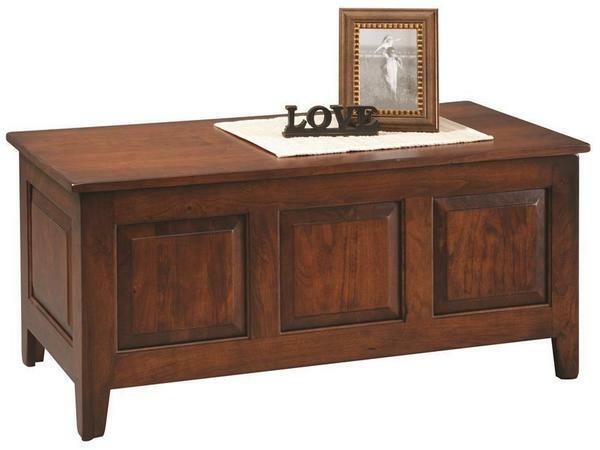 This cherry wood Shaker Chest makes an ideal coffee table with a height of 19" and length of 42 1/2". I just wanted to let you know the chest arrived (FedEx came at the exact end of their four-hour window). I opened the box all up and inspected it and everything's fine. It looks beautiful.